Born in Evanston, Illinois, I grew up in the San Fernando Valley, the third of four girls. I acted and modeled, beginning at age 12 with the role of an innkeeper’s daughter in an episode of the TV series Alias Smith and Jones. I was photographed for Teen and Seventeen Magazine and appeared in print ads that usually featured my hair or rear end (Herbal Essence Shampoo, Dittos, and Jordache Jeans.) My big acting break came at age 18 when I was chosen to play Nancy Drew on TV’s Hardy Boys, Nancy Drew Mysteries. Some recognize my racy role as Christopher Walken’s moll in the film King of New York. And I’m one of the few actresses who can brag about costarring with a chimp (B.J. and the Bear), killing a monster in the movie Humongous, and falling in love with Swamp Thing on TV. I was catapulted into a fast-paced life as a teenager when I lived in modeling agent Eileen Ford’s brownstone in New York , and I lacked the maturity to handle all that came my way. I danced at Studio 54, disco roller skated at a club in L.A. with movie and sports stars, partied a little too hard. I often found myself in dreamlike situations, and some were more like nightmares. The 80’s were a wild time for many, and I did not miss out. By my late twenties I had partied enough for several lifetimes and was completely fed up with dating. One night, a friend dragged me to a dinner in the Hollywood Hills, and I was seated next to my future husband, Michael Lansbury. A week later Mike invited me to a party at his home in Venice by leaving a message on my answering machine. At the end he added, “You can bring someone…but don’t.” We married in 1990, and two years later our first child was born. The difficulties I faced as a new mother caught me off guard. I had looked forward to motherhood all my life and assumed that caring for a baby would happen naturally. Instead, I soon found that I had no clue. My beautiful baby daughter’s needs were unrelenting, especially since I thought mistakenly that I should entertain her every waking moment. After spending my last ounce of energy attending to my baby, she would then sometimes cry for no discernible reason, and it put me over the edge. I found no effective child care strategy to latch onto in the parenting books I read. I was deeply disappointed in myself, lost and overwhelmed. My accidental discovery of Magda Gerber’s child care philosophy changed everything. I came across an odd, but intriguing one-sentence quotation from Magda in an article in L.A. Parent Magazine: “Take the mobile off the bed, take care of their needs and leave them alone.” This sentence gave me the mysterious sense that Magda held the answers I needed to understand child care. I began taking classes offered by Resources for Infant Educarers (RIE), the non-profit organization that Magda Gerber had founded. I was blown away while attending my first class when I placed my daughter on her back on the floor, and she remained occupied peacefully with her own thoughts for nearly two hours. I was inspired by Magda’s ideal of respecting infants, treating a baby as a person from the beginning. I could imagine that the respectful handling Magda espoused would foster self-confidence and independence, character attributes that I had struggled with myself. I now know that I am a person who needs clarity, and Magda’s structured, innately sensible approach provided that clarity. I learned how to best use my limited energy. If I gave my baby my full attention while feeding, diapering, bathing, or helping her to sleep, I could leave her alone to just ‘be’ while I took a break. 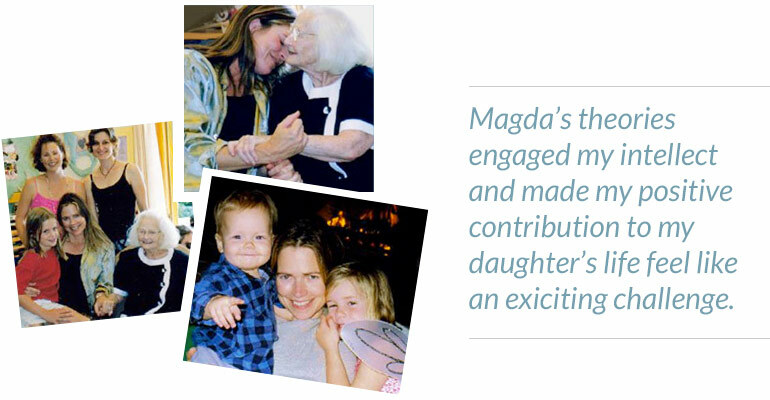 Magda’s theories engaged my intellect and made my contribution to my daughter’s life feel like an exciting challenge. My plan for the day didn’t always work, but at least I had one. When I began to sit back and observe rather than always ‘do’, I became fascinated by my infant, the person. Observing her as she stared at a crack in the ceiling or grasped onto a beach ball and examine it for several minutes was uplifting. I found that joy carried me through the more tedious aspects of the day. What began as a need for guidance became a consuming passion. I was driven to learn all I could from Magda Gerber. In my quest to know more, I enrolled in the first level of the RIE professional training. I had no intention of ever teaching RIE classes. The more I learned, however, the more captivated I became by Magda’s philosophy. For the first time in my life, I felt on track. I had found my calling. I continued my studies under Magda’s mentorship, and in 1994 I became a RIE Associate and a certified Parent/Infant Guidance Class instructor. During the last twenty years, I have made presentations at Early Childhood conferences, written articles and, unexpectedly, found that what I love most is teaching parents. I’m truly excited about sharing my experiences, both as a professional and a parent, here on my blog. Mike and I have three children now, and we often recognize in them the benefits of our RIE education. When I’m not spending time with my family, teaching, writing, or advancing RIE’s mission, you might catch me unwinding with a jog on the beach or practicing for my future career as an octogenarian Hip-Hop dancer. I’m done with the nightlife but still love to dance. Parenting is definitely the hardest, most rewarding job I’ve ever had and has led to even more joy helping other parents. I hope my adventures as a parent and teacher and whatever wisdom I’ve gained along the way will help you, too.